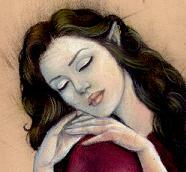 Liyan is a female Woodland Elf that lives on the Eastern edge of the Dramidian Forest. She sometimes visits Dramid, and lives alone in a small cottage surrounded by colorful gardens. Some might call her a hermit, but she's very friendly. It's just that no one else lives near her, and she doesn't want to leave her home. She is skilled in short-range combat, but her expertise, like all Woodland Elves, is the bow and arrow. Since a very young age, she has been training. She gets along very easily with all species, except for centaurs, which she strongly distrusts. She is also a bit wary of humans, who have constantly been trying to take over Elvish land ever since she was born. Zella is a female Human Ranger that lives just on the Western bank of the Atone River. She has always been fascinated by the peaceful lifestyle of the Elves, and it has been her goal to go live among them when she was old enough to leave home. She is skilled in some magic, but just a couple basics spells. Other than that, she is not extremely skilled in weaponry, as women in the human race are discouraged from battle. She is a very young adult, and sometimes very giggly and immature. However, when in a serious situation, she is very quick witted, and careful. Juniper is 15,000 years old but only appears to be a teenager. Her hair is blue and is down to her knees. she is skilled with the bow , like most wood elves, but she is also skilled with the sword which is strange for species. She is usually very easy-going except with centaurs because when she was very young one put a nasty scar on her hand.... She is very trustworthy and will almost trust about everyone (which is a weakness in some cases). Pheona has long, brown, wavy hair and green eyes. She looks about 18, but is actually 57 years old. She wears a white tanktop that shows her stomach and tan pants and loose tan boots, but, she wears a cloak over it. She has a sword tied to her side and a knife hidden in her boot. She travels all over but usualy lives in the woods, sometimes she stays in a tavern.